Rahul Dravid is a former Indian cricketer and captain, widely regarded as one of the greatest batsmen in the history of cricket. Born in a Marathi family and brought up in Bangalore, he started playing cricket at the age of 12 and later represented Karnataka at the under-15, under-17 and under-19 levels. Hailed as The Wall, Dravid was named one of the best five cricketers of the year by Wisden Cricketers' Almanack in 2000 and received the Player of the Year and the Test Player of the Year awards at the inaugural ICC awards ceremony in 2004. In December 2011, he became the first non-Australian cricketer to deliver the Bradman Oration in Canberra. Rahul Dravid ( ; born 11 January 1973) is a former Indian cricketer and captain, widely regarded as one of the greatest batsmen in the history of cricket. Born in a Marathi family and brought up in Bangalore, he started playing cricket at the age of 12 and later represented Karnataka at the under-15, under-17 and under-19 levels. 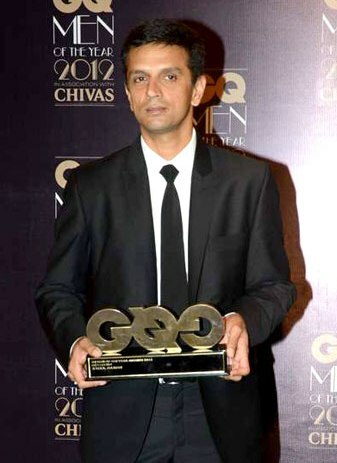 Hailed as The Wall, Dravid was named one of the best five cricketers of the year by Wisden Cricketers' Almanack in 2000 and received the Player of the Year and the Test Player of the Year awards at the inaugural ICC awards ceremony in 2004. In December 2011, he became the first non-Australian cricketer to deliver the Bradman Oration in Canberra. As of December 2016, Dravid is the fourth-highest run scorer in Test cricket, after Sachin Tendulkar, Ricky Ponting and Jacques Kallis, and is only the second Indian cricketer, after Tendulkar to score 10,000 runs both in Tests and in ODIs. In 2004, after completing his century against Bangladesh in Chittagong, he became the first and the only player till date to score a century in all the ten Test-playing countries. As of October 2012, he holds the record for the most number of catches taken by a player (non-wicket-keeper) in Test cricket, with 210. Dravid holds a unique record of never getting out for a Golden duck in the 286 Test innings which he has played.